You’ve crunched the numbers, and the math makes sense—it’s time to replace your equipment. Does that make you excited… Or nervous? It doesn’t matter whether you need a single component, a fully automated finishing system, or something in-between—Industrial Coating Equipment can help. We have the knowledge to help you choose the right equipment, the experience to steer you away from pitfalls, and the capabilities to get the job done right the first time. We provide finishing systems, powder systems, ovens and more—either custom-designed or sourced and supplied from other manufacturers. Even the most difficult coating applications are no match for our 30 years in the industry. Finishing systems, including powder and liquid. We offer in-house design, manufacturing and installation of our systems to meet your exact production needs. Batch powder systems to meet your specifications. Energy-efficient industrial ovens for preheating, drying or curing—convection, infrared (electric and gas; short-, medium- and long-wave), and UV cure. Process washers to wash, treat or prep substrates from plastic to castings. Available custom-built or packaged in stainless steel, mild steel and composite materials. Spray booths for all purposes—including liquid and powder paint spray—in a wide range of sizes, configurations and containment methods. From small plenums to stand alone buildings we can design and supply a booth to fit your requirements. Coating equipment designed to your specs or supplied to meet your needs. Because we are not distributors for any particular brand or type, we have the flexibility to offer a wide range from all major manufacturers of application and containment equipment. Conveyors—chain on edge, I-beam, powered and gravity roller, wire mesh, rubber belt, towveyors and more. 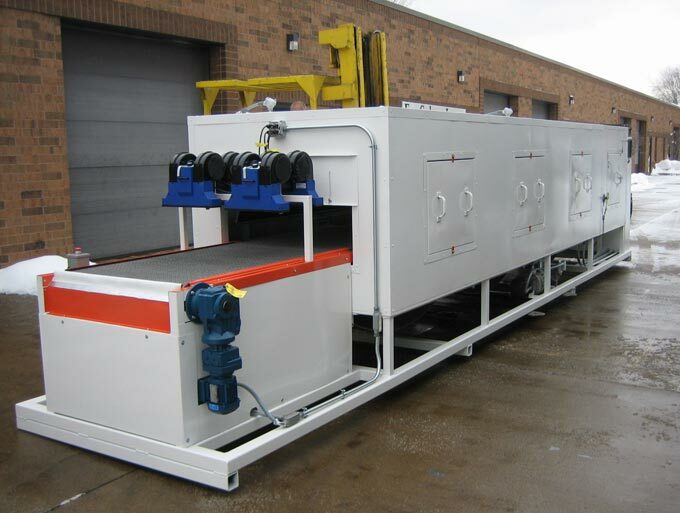 If it needs to move your product through your facility, we guarantee we can either design it or supply it. We also manufacture both long and short stroke reciprocators, vertical and horizontal gun movers and pick-and-place units for a variety of custom applications. Can we help you get started with your new equipment?